Thank you for making a donation to Circus Starr. Your support today will create a memory for a child that will last a lifetime. We are an independent, charitable organisation that supports disadvantaged and disabled children across the UK. Established in 1987 we provide new opportunities for children and their families to share an enjoyable time together, free of charge. We have seen time and again how a trip to the circus can change a child’s life and your donation will help bring the fun, excitement and magic of the circus to children who would not normally get chance to experience such an event. With the funds raised from our world-class circus production, we aim to create long-term change within the towns we work by raising awareness of the issues facing disadvantaged children. We rely heavily on the generosity of supporters like yourselves and without your donation could not continue to put smiles on the faces of more than 1,000 children in your community each year. 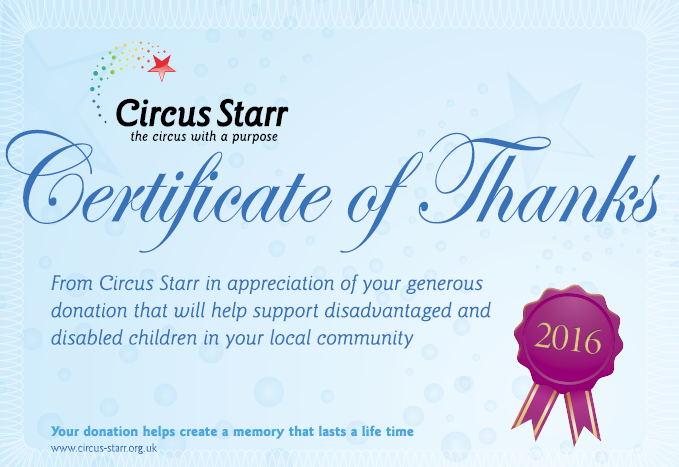 On behalf of all the staff at Circus Starr, a big ‘thank you’ for your support. May I also personally assure you that the children and families in your community will benefit directly from your donation.